Anyone who has a sand pit knows how frustrating it is that they seem to hold far too many of these bags and at £2.50 a bag it usually costs more for the sand than the sand pit. 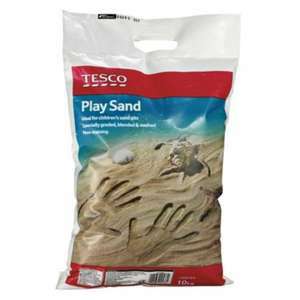 Tesco currently have the sand reduced to clear (i think our summer is over before it began!, White SEL so should be national and a bargain at 63p a bag. Bring the fun of the beach to your garden with this 10kg bag of children's play sand. Perfect for use with sand pits and play tables, the sand has been specially graded, blended, washed and smoothed to ensure it is not scratchy on delicate skin. It is also less irritating and easier to remove if your child gets it in their eyes. Furthermore, it is non-toxic and non-staining, providing children with hours of safe, clean outdoor fun, ideal for stimulating the senses and encouraging creativity. Also suitable for use in school athletics, beach volleyball courts, general play areas or for just building sand castles. 15-20x 10kg bags will cover approximately 1 square metre at 10cm (4”) deep. Brilliant for aquarium substrate too ! My local Inverness store had loads of 10kg sand bags but they were £2.50, the design was different than the one on the OP's post though. Because reductions are most commonly used to get items off the shelf to create space for new products therefore there will be more in store as space is more limited. Its not the one in the pic, i didnt add that. Ita a picture of a wee boy in a blue shell sandpit barcode 5000436045779. Did you can it to check the scanning price? Its summer reduced to clear stuff so should be national. Availibility depends on stock. If your store stocks them then they should be this price. I manage to get a lot of the instore deals from on here but maybe im just lucky. Availibility depends on stock. If your store stocks them then they … Availibility depends on stock. If your store stocks them then they should be this price. I manage to get a lot of the instore deals from on here but maybe im just lucky. Its not the one in the pic, i didnt add that.Ita a picture of a wee boy … Its not the one in the pic, i didnt add that.Ita a picture of a wee boy in a blue shell sandpit barcode 5000436045779. Did you can it to check the scanning price? Its summer reduced to clear stuff so should be national. ​Yes, I scanned one from the pallet outside and one from the toys section but both scanned at £2.50.